More mail & opportunity chasing; extraordinary to see WordBasic (obsoleted in Word 97) still being actively used in macros today - fun. Commercial call, plugged away at testing LibreOffice and some E-mail; sync. with Philippe. Pancake day - enjoyed some fine pancakes. E-mail chew, meeting, status reports, analysis; TDF board call. NCC in the Stable; rather sad to chat to a long standing church member abour what I do, and find she's using OpenOffice: five years behind the feature curve - annoying. Ran the younger lot of the older kids work ( or something ), Ephesians 4 - the decietfulness of sin, putting off the old self & on the new one and so on. Back for a fine roast lunch with Dwayne & family; chatted happily through the afternoon. Played Port Royale with the babes afterwards. Tea, put people to bed. Tidied the house a fair bit; Julie over for lunch, cake & games - her Birthday; Dwayne, Heather, Phillipa & Jessica over for the afternoon - lovely to meet the whole family & catch up. Up lateish preparing kids work for tomorrow. Up early; took babes to school, went for a run with J. Back, catch-up with Marina, sync with Miklos, lunch somewhere. Caught up with Lenny, and some document work. Alex & Madeline over after school. Did some baptism prep. with them: Christianity is a fight, count the cost - etc. Back for a Bourne movie with H. and N.
Customer call; partner call; analysis. Discovered that my presentations were being mangled by some text/fit issue since I'd set export format to avoid some vital extensions: phew; reset my export settings. Up late preparing material for Baptism class on Friday. Excited to be demoing a new Ubuntu / Snap based solution alongside Ubuntu and Nextcloud at MWC Barcelona. Also pleased to see AMD release Ryzen Making 16 threads accessible to everyone - helping your LibreOffice compiles (and load times of course too); good stuff. Mail, financials with Tracie, call with Eloy; then Ash & Kendy. Built ESC stats. Out to cubs in the evening with M. - ran a code-breaking table with several fun encoding schemes. Poked mail; sync. with Kendy, consultancy call. Out for a walk, lunch. Back to financials / 2017 projections and calls. NCC in The Stable in the morning; Tony & Anne back for lunch, played a game; quartet practice, tea & read babies. Up rather late; breakfast; slugged variously. Driven home with babes and more Green Ring-ness. Relaxed variously & watched Robin Hood, Prince of Thieves. Up; worked through the morning on the mail and task backlog. Out for a walk to see some ponies with the babes at Thorpness. Back for lunch, and then to tackle the plumbing problems. Attacked an amazing amount of congealed fat in the sink plumbing - simply extraordinary; eventually had to cut the pipe-work out in sections and replace it with H's help. Relaxed in the evening with some fine food. Couldn't sleep, hacked on socket code instead. Poked at socket code a lot in the morning; drove to Aldeburgh with the family - listened to the Green Ring Conspiracy in the car. Chat with Philippe, ESC call. More hackery. Awoke again to the dulcet tones of the neighbours extension being drilled / compacted / etc. Hey ho - they get to enjoy our early morning piano practice I suppose. Built ESC stats. Most encouraged to see that the German comment count has dropped by ~10% in the first two weeks of February - ~320 lines fewer (of 3600) thanks to: Johnny M, Michael Stahl (RedHat), Katarina Behrens (CIB), and Lukas Röllin - wonderful. Sync. with Ash; interview in the evening. Nice set of Valentines Day cards for the whole family; dug away at drear contract review much of the day. Watched and fast-forwarded some James Bond for H. and N. in the evening. Hacked until late on improved non-blocking socket code. Up lateish; babes on half term holiday - team meetings; E-mail, code review with Ash. E-mail deluge, board call, chase Cyber Essentials certification; dinner, more paperwork. Overslept vigorously, to the stable for NCC; Claire explained Ephesians 1 well - helpful; back foor lunch. Off to pick up littlies but too late for the service. Lots of stories. Played with them in the afternoon; stories, bed. Up very late indeed, slugged in bed chatting to J. & bigger babes. Late breakfast, H. out swimming with Alex, Elise & H?. Spent my time mending the toilet - new float valve is much larger than the previous one - requiring odd angles, silicone bodgery and worse. Out for a walk with J. on the heath - nice. Swimmers home, for a Bourne movie with N. followed by tea & card games. Dropped Alex home. Put babes to bed. Mail thrash much of the day; caught up with Kendy before he left for vacation; sync. with Ash. Dropped E. M. and Kelsey at GenR8. Mail chew, admin, contract review, built ESC stats rather late; ESC call. Out to H.'s GCSE choices day - interesting stuff. Up lateish; mail chew; to work ! H. feverish and at home; worked away at mail by the fire with her a bit. Beta Co-working; actually got some hacking done: whoot, though very trivial. Worked away on the train, got a few patches CI'd and included between network black-spots. Lovely to be home again and see four babes, and one georgeous lady. Off to the Beta Co-working; had our own room this year - to avoid distracting others; good to have so many hackers in one place. Pursued by admin. Out to the same restaurant as last night fun. Another great day of FOSDEM; stood around saying what-ho to all and sundry, good to catch up with so many. Up early; Bedford is rather good; walked to the FSFE offices, a whole day of (occasionally exciting) TDF board meetings. Out in the evening for dinner - but went instead to a kebab place & on to the Delerium Cafe - which was much less dangerously crowded than previously, good. Up, interesting customer call; is it easier and cheaper for Collabora to reverse engineer a 3rd party's usage of COM for automating MS Office, than getting a large SI to react ? - probably. Loraine B. over to see J, nice to catch up with her. Trains variously to the Eurostar for FOSDEM, TDF meetings on Friday, and HackFest afterwards. Today we release LibreOffice 5.3.0, the next step in our journey: rich in features indeed - but (understandably) the media like to focus on the things you can see. What about the things you cannot ? the increasingly awesome underpinnings on which we're building the next round of improvements. Again - to see the pretty things people made and (more importantly) who did the heavy lifting checkout the user visible features from many great hackers, translators, UX designers etc. Here I am going to focus on the under-sung heros of making everything else better. There is an official 5.3 wiki page, but I expand on this and dive in more deeply here. 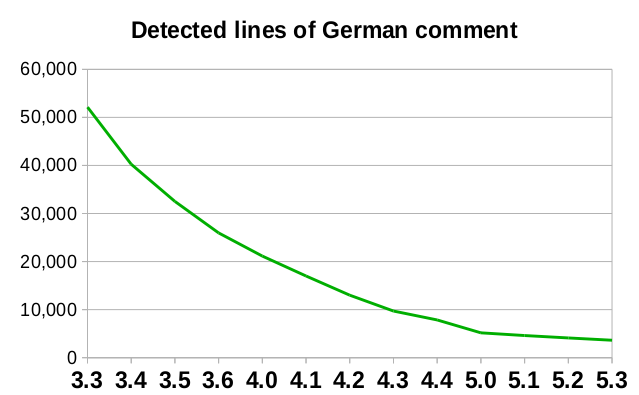 One thing that perplexes me about LibreOffice 5.3 is how we can have managed to translate 50,000 lines of German comments to English, but the last 3700 lines continue to defy us. Is it that people don't like finishing things ? Is it that the interest in comment translation is proportional to the number of remaining comments ? Seems unlikely - many of the remaning comments are in writer and calc. Either way - there is some lingering low-hanging glory for the person who can rid us of the last comments here ! Many thanks to Johannes Berg, Maarten Bosmans, Tor Lillqvist (Collabora), Julian Mehne and Albert Thuswaldner for taking on a few comments and to Phillip Szelat for updating the bin/find-german-comments tool. A short list of strings to whet your appetite; please do help finally dispatch this gasping dragon if you're a native German speaker (or competent context reading programmer). Markus Mohrhard's great work integrating a Breakpad based crash reporter has been extraordinarily useful. You can browse the crash reports here by version, and we've had over thirty crashreporter related fixes in 5.3 targetting particular issues. It is great to see commits like this that can quantify the win (20% of daily crashes in 5.2.0.4). We managed to nail lots of the most frequently reported issues soon after deploying the reporter. 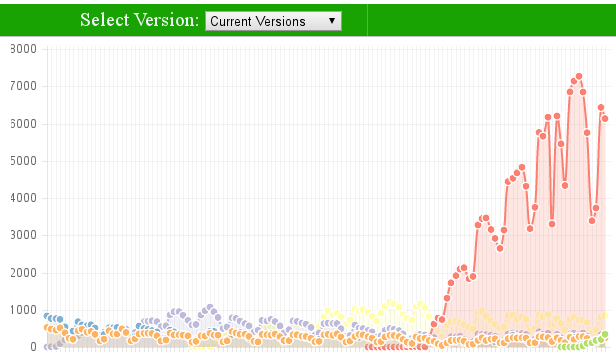 Which allowed us to somewhat accelerate the next release containing a fix (hence 5.2.5.1 vs. 5.2.5.2). Markus also nailed a whole clutch of evil badness around processing of events during very late shutdown of LibreOffice that we hope will improve things still further. Another curious issue is that Windows, even Windows 64bit has a fairly hard (for an ISV) limit of 10,000 gdi objects (should be enough for anybody) handles per process. This was leading to lots of extremely diverse symptoms - with inexplicable failure cases above the window abstraction. Thanks to Markus Morhard for adding the ability to report the number of open GDI handles to crash reports, and Kohei Yoshida (Collabora) for fixing a gratuitous consumer of these handles for 5.3.1. Coverity scan - our Coverity numbers continue to be outstanding, thanks to the hard work of Caolan McNamara with a nice round 256 commits in this release. Happily (or not) we upgraded coverity version, and found a new check - throwing up another 400 warnings just before the release. Enum scoping - Noel Grandin (Peralex) has had 180 commits cleaning up and making consistent our very many old, inconsistent & poorly scoped enumerations. unique_ptr - lots of our code uses a pImpl pattern, thanks to Xisco Fauli, David Tardon, Arnold Dumas and others for cleaning this to use the safer unique_ptr template. At many places, we were using own integer types instead of standard ones due to legacy. Many of them were cleaned up previously, but there are still various outstanding uses here and there. For 5.3, many of TCHARs / _tstring, sal_uIntPtr, or sal_Size uses were changed - thanks to Stuart Swales, Marian Scerbak, Michael Stahl and others. Google Fuzz - the lovely ossfuzz project is providing some great value to us thanks to Google, and also Caolan McNamara (RedHat) for getting LibreOffice integrated into their tooling. Clang Plugins - with 200 commits to the compilerplugins directory this series - we gained a number of Clang plugins checking corner cases, and enabling lots of cleanups. Overall this gave nearly 800 commits to the core fixing some auto-detected badness - from a who's who of Clang users - thanks to: Stephan Bergmann (RedHat), Noel Grandin (Collabora), Miklos Vajna (Collabora), Tor Lillqvist (Collabora), Caolán McNamara (RedHat), Michael Stahl (RedHat), Markus Mohrhard, Mike Kaganski (Collabora), Kohei Yoshida (Collabora), Jochen Nitschke and others The top plugins generating commits were: passstuffbyref, expandablemethods, singlevalfields, stringconstant, countusersofdefaultparams, staticmethods, redundantcast, cppunitassertequals, constantparam, unusedmethods. Address & Undefined Behavior Sanitizers - its great to see more than sixty patches referencing ASan and UBSan - finding nasty memory issues faster. Crash testing - continues across a growing suite of around 100k documents; thanks to the RedHat team for keeping the numbers consistently at or near zero. As always we continue to grow our unit test count, and number of assertions (and assert calls). The tests are run by the Jenkins CI infrastructure on commits before they are merged. Thanks to so many for adding tests and stopping things from regressing particuarly those who had more than 20 commits to the unit tests: Zdeněk Crhonek, Miklos Vajna (Collabora), Stephan Bergmann (RedHat), Caolán McNamara (RedHat), Justin Luth (SIL), Eike Rathke (RedHat), Noel Grandin (Collabora), Armin Le Grand (CIB), Michael Stahl (RedHat) And also to those with more than 10 commits to the unit tests: Tamás Zolnai (Collabora), Laurent Balland-Poirier, Tor Lillqvist (Collabora), Katarina Behrens (CIB), Markus Mohrhard, Mike Kaganski (Collabora), Takeshi Abe, Mark Hung, Giuseppe Castagno. It always takes more time to write a test, there is always a temptation not to - thank goodness they helped. Thanks too to Michael Stahl (RedHat) for tackling a number of horrible threading races and mis-designs causing intermittent failure in our unit tests. One notable improvement in 5.3 has been the work from Zdeněk Crhonek adding 280 or so nicely organized unit test sheets for each Calc function and some of its corner-cases to the tree, and even more encouraging to see these extended when bugs are fixed. Another area that got a number of nice unit tests was the old-style Parser and new XFastParser implementations thanks to Mohammed Abdul Azeem laying the ground for our incremental adoption of the XFastParser for LibreOffice 5.4 for ODF formats. Great to write tests before the code. Thanks to Markus Mohrhard and our generous donors we have a shiny new UI testing framework in LibreOffice 5.3. We even have tutorials ( part 1 and part 2) to help people add new tests. Checkout the code in uitest/. It is always good to see a whole new class of testing enabled, and provides a nice place for people comfortable with python to make a really important contribution. There were really a lot of changes in the LibreOfficeKit APIs and in the online code to interface with them; these two modules are tightly coupled. For details and credits I wrote most of this up for the CODE 2.0 release, around the time of the feature freeze. A number of important fixes and performance improvements made their way into 5.3 (many of which are back-ported to 5.2 as well). We have used guards - which are created and destroyed in pairs around any OpenGL block - to catch buggy & crashing drivers inside those execution blocks, in order to disable OpenGL. In 5.3 these were adapted to OpenCL as well thanks to Tomaž Vajngerl (Collabora). In addition Michael Meeks (Collabora) added a test spreadsheet that is re-calculated using OpenCL whenever the driver changes - in order to catch badness in driver implementation - somewhat sad that these are necessary; it would be hoped that just asking a (software!) OpenCL driver for its version (to see if we can black-list it) would not hard-crash, but apparently that is too much to ask. Anyhow - now we cope well with lots of sub-optimal situations, and as such removed the legacy 'Test' button for manual CL driver selection. The VCL / OpenGL backend got a large number of performance improvements from Tomaž Vajngerl (Collabora) including batch rendering of pixels, lines, rectangles and polylines and deferred texture rendering - these help to push more work to the GPU in one go improving performance. Automatic screen-shotter - one of the problems of maintaining documentation in LibreOffice is that of taking UI screenshots and keeping them up-to-date for all languages. Thanks to Katarina "bubli" Behrens (CIB), Armin Le Grand (CIB), Thorsten Beherens (CIB) and our donors - we now have an automated tool for building screenshots. Checkout the documentation. Threading wins - we deprecated the grim old windows-like osl::Condition API in 5.3 in favour of the much more sensible (Unix like) std::condition_variable - which makes it easier to write safe code. Thanks to Stephan Bergmann (RedHat) for fixing a related Thread Pool thread-safety issue. Also to Kohei Yoshida (Collabora) for unwinding an underlying threading issue in our ZIP file handling hurting threaded XLSX import. gtk+3/Wayland - thanks to Caolan McNamara (RedHat) we have much improved gtk+3/wayland support in 5.3, one gem is OpenGL slide transitions. Improved MathML support thanks to Takeshi Abe who continues to do excellent maintenance and bug fixing work on our math component. MS Office URI schemes - were added to much improve LibreOffice's integration with Windows web browsers and particularly Sharepoint for launching and editing documents thanks to Mike Kaganski (Collabora). Firebird - it has been good to watch Wastack fixing lots of blocker bugs for us to be able to use the upgraded Firebird 3.0 as our default database engine in 5.4 with lots of great commits. Calc dynamic columns currently we have a fixed array of columns for each sheet; thanks to Dennis Francis we are creating a nice new encapsulations to eventually change this to a more powerful, and efficient sparse data structure. Thanks to Maarten Bosmans for moving rapidly from translating German comments to improving Calc style and formatting performance as well as fixing bugs. Much improved Calc functions with many bug fixes and new functions thanks to Eike Rathke (RedHat), Winfried Donkers, and others. Significant interoperability wins thanks to Justin Luth who has tackled over eighty nasty bugs across DOC, DOCX and other formats. Android cleanups - its great to see lots and lots of code cleanups this cycle and many ongoing improvements with some great work from Aleksandar Stefanovic, Mert Tumer, Christian Lohmaier (TDF), Mirek Mazel and Otto Kekäläinen slowly making the app more polished. The QA team do a noble job struggling against great odds; you can see those doing the hugely valuable triage and fixing work in the QA stats for 5.3.0 wiki page. During this release cycle in August we had the pleasure of having Xisco Fauli join TDF - funded by our generous donors - to support and contribute to the QA team; their hard work together has got our UNCONFIRMED bug count way down - accelerating a vital feedback loop between users and developers. Pootle was upgraded this cycle bringing a wealth of improvements for our translators. From little things like allowing special characters in usernames, to major performance improvements allowing us to extract translations into our builds much more quickly. Other great features such as improved notifications with feedback on changes, off-line translation memory are much appreciated. Thanks to Dwayne Bailey (TranslateHouse) and our sysadmin team. libstaroffice: Integrated library to support the old StarOffice file formats. Lots of fun stuff going on at LibreOffice - quite apart from the visible feature development. Its a great place to find a home and contribute. If you want to get involved there are plenty of great people to meet and work alongside - come and see us at FOSDEM for example this weekend. As you can see individuals ('Assigned') make a huge impact to the diversity of LibreOffice. LibreOffice 5.3 is great; it is made by a set of developers having fun, working together, and building an increasingly attractive and beautiful Free Software Office suite, I hope you enjoy using it. Thanks for reading, don't forget to checkout the user visible feature page and thank you for supporting LibreOffice. Raw data and commit stats built using our gitdm-config - are available for many of the above graphs. Mail chew, sync. with Bubli, text tweakage with Lenny. Worked late building an under-the-hood update with Kendy's help.